I live in S.CA & I’ve been trying to figure out to compensate for super hot days that tend to burn lawns automatically. 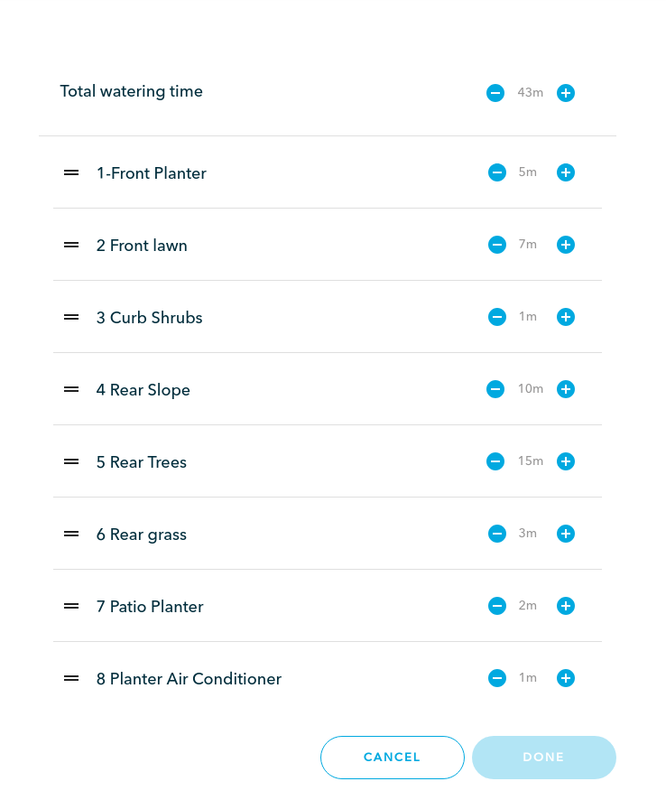 What parameters are used to set up the system to water more times during the day based on temperature? Currently I had to add a fixed manual time to a zone to help prevent burning but would like to automate the functionality with a flex schedule. My other problem is that if I increase the watering times with flex then I have too much run off. Any ideas? The basic answer that I’ve seen is use IFTTT to trigger based on a local temperature. What kind of turf do you have? Do you usually water daily? @Psycho_pete If you post your advanced settings and maybe a screenshot of your moisture graph (expanded with watering details) for the next week will help understand your issue. Hi Fanz, Here you go. I have the water settings from my old fixed controller. What I expected was to set up this unit do that on hot days it waters the same way and the backs off from there based on weather and various conditions etc. Please put a “?” With a help screen describing the ivom buttons on your app. I can’t even find the send button! Icons, guess reply and reply mean the same thing originating and sending a message? Couple things going on here. 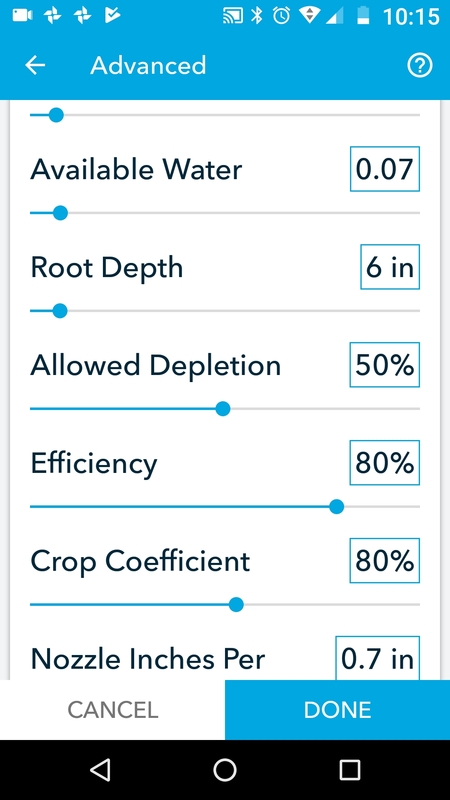 Your available water capacity is really low (.07 inches). Assuming you picked a sand type soil. This means you will water about every day since the soil can’t hold much water. Loam is our default at .17 inches. Looking at your moisture graph you are watering every day because the daily crop evapotranspiration is greater than how much water you are putting down (.21 inches). With cool season grass I’d assume you should be watering every 2-3 days. I also noticed that you are watering for just a few minutes on your grass zones. Flex daily is meant for deep, infrequent watering versus daily short waterings. Your entire schedule is 43 minutes. For a contrast in CO I water my front cool season grass zone for about 35 minutes each watering, as infrequent as I can. Hotter months it waters more frequent, cooler months less frequent. Please let us know if you have followup questions. This is a good starting point to explain how they work. You have some good points. Our city restrictions don’t allow run off and that’s what I get if I water for longer periods of time. If I could water a few times a day to compensate that probably would do it, just let me know how to set that up. The reason I purchased this unit was to vary the watering with temperature and seasonal shifts. If I wanted a fixed dumb watering solution I would have stayed with my conventional controller. I’m confident with a few tweaks your system can perform very well. Thanks again! 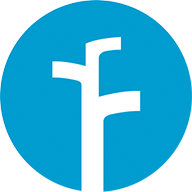 Use our smart/cycle feature if you are concerned with runoff. I’d set it up manually in the schedule max 7 minutes with 30 minute soak for the zones you are concerned about. Here is more information. Flex daily will ultimately do this but needs some fine tuning in the beginning to setup. I’d actually just start with one grass zone and see how it performs before rolling out to other zones. It could take a week or two to get used to how it waters. The moisture graph will show simulated watering for the next two weeks so there are no surprises. I’d start with the defaults that we generate for the zone and then we can go from there. Hope this helps. Yes, I agree with watering less often but when your in a desert with temperatures @115 F crushed granite as a base soil you don’t have many options. I’ve tried it and grass turns brown very quickly. Long term the goal is to stretch out watering intervals but for now I can’t. Even if I could switch between fixed and smart watering scemes based on temperature would help. 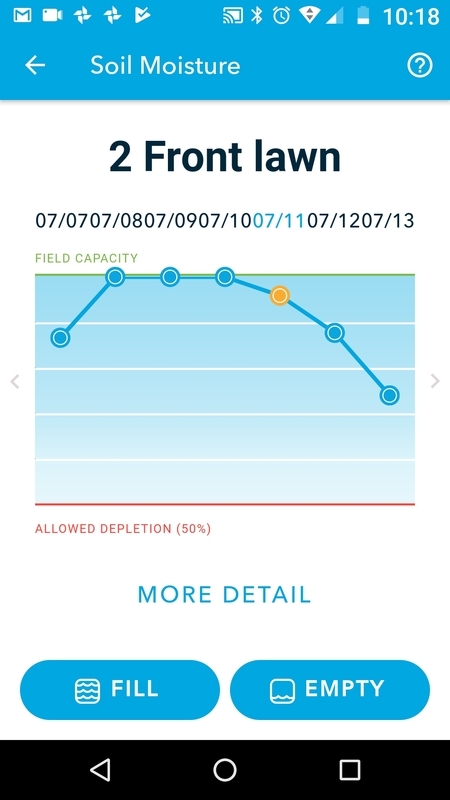 Apparently you can’t adjust to a full watering cycle using smart watering because of current design rationale. A quick observation - Your efficiency is listed as 80% - that simply is not possible with sprinklers. Thank you for your support! That’s what I’m looking for! I need to understand all of the parameters so I can make sense out of it!!! but when your in a desert with temperatures @115 F crushed granite as a base soil you don’t have many options. I and others here live in a desert with those temps and crappy desert soil and we’re on Flex Daily. I don’t water daily in those temps. The system can handle it but your lawn/roots seems trained to to expect water daily or even multiple times a day. That isn’t a controller issue. I agree but the summer isn’t the time to make changes from the way the old controller was set up. It will take time to Transition and test. It’s not false. It works for me in a 115F desert climate, which is what I stated. He also said that he had hard soil, not sand. Had he said he had sand I would have answered accordingly. Even his moisture chart isn’t showing that. If he had sand it would have been bottoming out and that’s clearly not what his moisture chart is showing. Yes because you have different soil. Like I said what works for you doesnt work for everyone. As Franz mentioned earlier he has .07 AWC indicating sand. 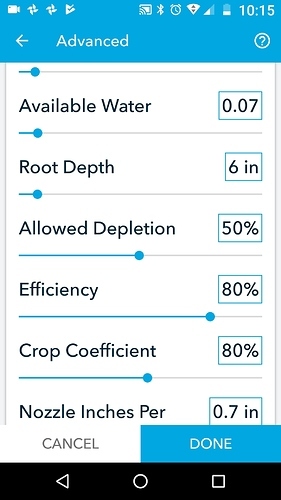 So what rachio thinks the soil moisture is doesn’t reflect what the soil conditions are (bad information = bad results). If he is getting runoff with only a few minutes watering then he must have a different soil which in turn means a different AWC. As Franz mentioned earlier he has .07 AWC indicating sand. My bad, I didn’t see that part. I agree, the soil setting is probably a big factor.